Archives : SENSEX SHIVERS; AS QUAKE ROCKS JAPAN - 11/03/2011. SENSEX SHIVERS; AS QUAKE ROCKS JAPAN – 11/03/2011. A massive earthquake of the magnitude of 8.9 on the Richter scale, hit Japan. This was followed by tsunami on the coastal region of Japan. This was the biggest quake in the last century in Japan and possibly the fifth biggest in history. As a result ports, airports and rail networks were shut down. Besides tremendous loss to human life, there was reportedly some damage to the nuclear facility and a major oil refinery caught fire. As a result, oil fell for the first time in last ten days as it went just below $100 per barrel. The resultant impact was seen on our market as it dropped down by over a percent. But the market will give a more measured response on Monday after digesting the bad news. MARKET FAILS TO OVERCOME RESISTANCE ZONE. 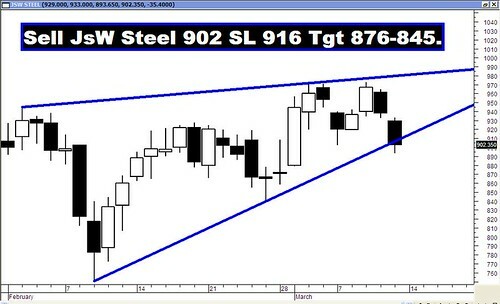 Last week, we had mentioned that the market faced strong resistance at Sensex (18559-18582) and Nifty (5561-5563). The market exactly fell from these levels i.e. Sensex 18583 and Nifty 5563. The market has to close above these resistance zones and only then can we say that short term uptrend has resumed. Till then we continue to remain in downtrend in all time-frames i.e. short term, medium term and long term. The Sensex opened the week at 18361, made a high of 18583, a low of 18058 and closed the week at 18174. The Sensex lost 312 points on a weekly basis. Similarly Nifty opened the week at 5490, made a high of 5563, a low of 5408 and closed the week at 5445. The Nifty too closed with a loss of 93 points on a weekly basis. On the daily charts both the indices have formed a small black body Spinning Top formation, which is a neutral formation. This is the third black body candle in as many days while falling down, but this cannot be classified as Three Black Crows as the bodies are small. 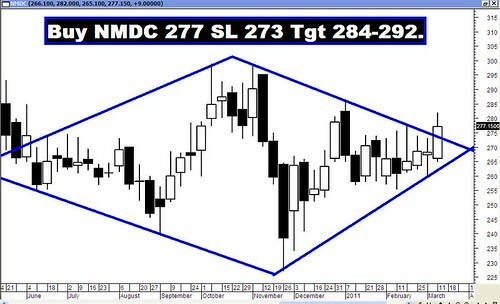 On the weekly charts, a Bearish Harami pattern has been formed on both the indices. This is a bearish reversal pattern after a Tasuki line formation, which was observed last week. The market is flirting with the short term trend as it once again closed below the 20dma (Sensex – 18217 and Nifty – 5455) after giving a buy signal just a week before. As a result the short term trend has once again turned down. Long and medium term trend continue to be down as the market is trading below the 200dma (Sensex – 18881 and Nifty – 5667) and 50dma (Sensex – 18689 and Nifty – 5599). One interesting thing observed last week was a bearish crossover of the 50dma and 200dma. This is not a good omen from the long term point of view, as invariably the market has dropped substantially. This is the only the second time in the last six years that this bearish crossover of 50dma and 200dma has been observed. Last time, it was in March 2008 and market participants are well aware of the danger and remember how much damage it inflicted the last time around. Both the indices, once again failed to cross the strong resistance mentioned last week. Infact the both Sensex and Nifty fell from the resistance mentioned in the last weeks article. This week was the fourth unsuccessful attempt at crossing this Resistance zone. The Resistance zone for the Sensex (18559-18582) is created by 38.2% of the medium term fall from 20664 to 17295 and 61.8% of the shorter term fall from 19340 to 17295 for the Sensex. For Nifty the Resistance zone (5561-5563) is created by 38.2% of the medium term fall from 6181 to 5177 and 61.8% of the shorter term fall from 5801 to 5177. Thus for any uptrend to resume, it is imperative that the market closes above the resistance zone. If the recent fall continues, then we have to consider the correction of the recent rise from 17295-18736 for the Sensex and 5177-5608 for the Nifty. The correction levels are placed at 18185-18015-17845 for the Sensex and 5443-5392-5342 for the Nifty. In case the lower level of 17845 for the Sensex and 5342 for the Nifty is breached, then the market might test its recent bottoms at Sensex 17295 and Nifty 5177. In Bear markets, the bottoms are normally breached and if that happens then we have to find lower support zones. Hence if we consider the medium term rise from 13219-21108 for the Sensex and 3918 to 6338 for the Nifty, then the retracement levels will be 18094-17163-16233 for the Sensex and 5414-5128-4842 for the Nifty. If we consider the entire rise from 7697 to 21108 for the Sensex and 2252 to 6338 for the Nifty, then the correction levels for the Sensex will be at 15985-14402-12820 and 4777-4295-3813 for the Nifty. Thus in case, the low of Sensex 17295 and Nifty 5177 is breached; the Sensex is likely to test the cluster of supports emerging between 16233-15985 and Nifty between 4842-4777. Oscillators are painting a mixed picture. MACD, even though in negative territory continues with its Buy signal. The ROC has turned negative and given a Sell signal. RSI has gone below 50 and as a result given a Sell signal. Stochastic Oscillator too is in a Sell mode as %K has cut %D from above and signaled a Sell. Money Flow is at 44 and that too is in Sell mode. OBV continues with its Buy signal. ADX has fallen to 16 suggesting that the current trend has lost its strength. The Directional Indicators have given a Sell signal as +DI has cut –DI from above. But this signal has little reliability as the last two buy and sell signals ended in whipsaws. Nifty O.I. PCR is quite steady at 1.33. Highest Put writing is seen at 5400, which is likely to act as a support. Call writing is seen at 5700 and 5500 strike which will act as resistances. The Trendline Resistance for the Sensex is at 18589. The Trendline Support is at 17644. The Trendline Resistance for the Nifty is at 5557. The Trendline Support is at 5287. For the week ahead, Sensex will find Support at 17952-17728-17488 and will find Resistance at 18452-18736-18954. For the week ahead, Nifty will find Support at 5377-5310-5232 and will find Resistance at 5524-5608-5690. Once again majority of the targets were achieved except for GSFC. The star performer for the week was Reliance Media which went up by an amazing 9%.